The lone star tick, named for the prominent white dot on the back of the adult female, is very abundant in south central and south east U.S. Over the past several years, this tick has started to become fairly abundant in Iowa, especially in the southern half. Although lone star ticks are most active in May and June it is possible to find the adults active on warm days throughout the winter and early spring. Each lone star tick must have 3 blood meals to develop to the adult stage. This species has a wide host range. Adult ticks are commonly found on large mammals such as cattle, deer, horses and dogs. The immature ticks may feed on the same hosts, though they prefer to feed on birds and small mammals. All stages of lone star tick will feed on people. Lone star ticks do not transmit Lyme disease. 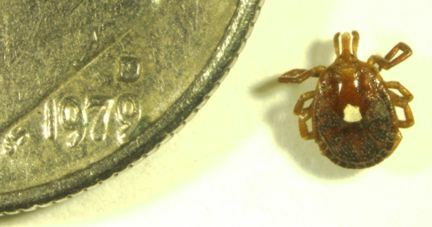 Lone star ticks do vector some other diseases, to be safe, any unusual symptoms that occur following the bite of any tick should be reported to the family physician as a precaution. For more information about ticks in Iowa, please see ISU Extension publication #PM2036, Ticks and Tick-borne Diseases. To see more photos of ticks, please visit our insect image gallery.